Over the years, Watermark Learning has constantly worked to improve our products based on feedback from our students and customers. Recently, we have added several new features to our Online Study Exams that were a direct result of your feedback. The biggest new feature is the ability to review any previous exam taken in a subscription. Previously, you were only able to review the questions and answers of your last exam. We know that the ability to review any and all of your previous exams is a great benefit to have in your certification preparation, and we are delighted to bring this feature to fruition. We have tinkered with the algorithms for selecting questions over the years, and had slight improvements. We wanted to avoid a set, fixed batch of questions, so we designed a robust database structure that allowed us to randomly pull questions each new exam. The downside of that is randomization causes repetition.We finally had a breakthrough this summer with a method to track the questions used. This method now avoids selecting them again until the questions in a given Knowledge Area are exhausted. Drills were finished a couple of weeks ago to use up all questions in a Knowledge Area before repeating any. If you do enough drills, you will see repeating questions, but the repetition will be delayed more than with the random method we previously used. Warm-ups and Simulations will be updated next. We have added the ability to select specific Focus Areas (Techniques, Intro, Underlying Competencies) to the v3 CBAP and CCBA exams. You can still choose one or more Knowledge Areas to drill on, in addition to a Focus Area for that drill(s). We have added case study questions in the CBAP v3 OSE. They more than comply with IIBA’s approach and objectives. We added new scenario-based questions to the PMP Online Study Exam question bank. Thank you to all of our students and customers who have provided us with feedback on our products. It is your feedback that keeps the improvements coming to make our study materials even more valuable for your certification preparation. Feel free to give us feedback on these latest changes or other products. Is the Online Study Exam exclusive of the guide? Each Online Study Exam is designed around the respective Body of Knowledge (BOK) that an individual will be tested on. For example, the CBAP and CCBA Online Study Exams are designed around the BABOK Guide v3 and the exam blueprints provided by IIBA. 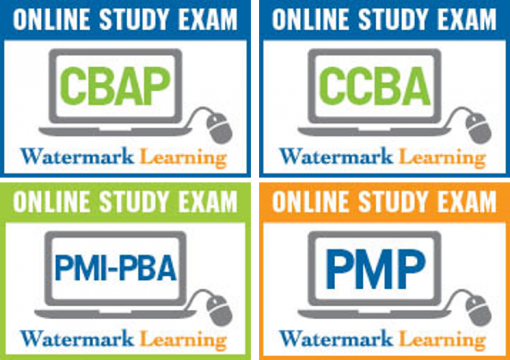 Our Online Study Exams can be used alone, along with the BOKs, as a study resource to help prepare for the CBAP, CCBA, PMI-PBA, or PMP. Each subscription contains three different modes with realistic questions, similar in tone and quality to the actual exam, as well as instant detailed feedback to reduce surprises and increase confidence. If you have any other questions regarding our materials, please contact us at products@watermarklearning.com.